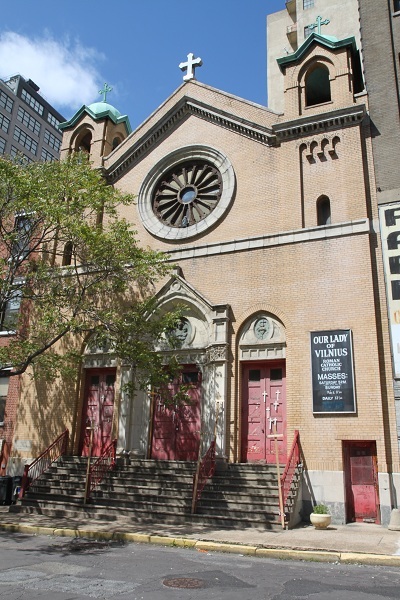 Our Lady of Vilna (or, as it was known in later years, Vilnius) was one of the most modest parishes on the island of Manhattan. It served a nationality, the Lithuanians, who never became as prominent or numerous here as they did in parts of the Midwest. 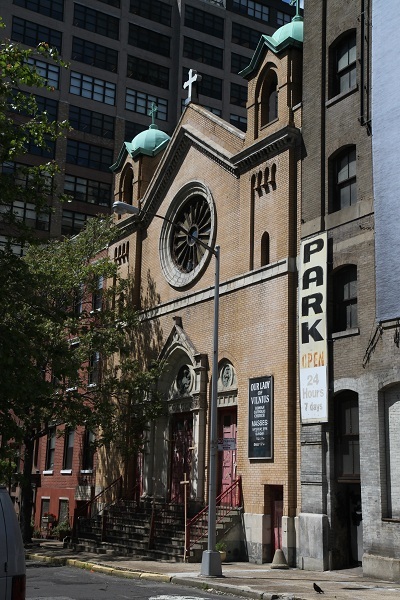 And not too long after the completion of the church in 1910, the Holland tunnel and its approaches were built right though the neighborhood just a few doors from Our Lady of Vilna – hardly conducive to the long term health of the parish. Yet in the early 1980’s Our Lady of Vilna seemed in relatively good health under the leadership of the pastor Fr “Vito” Padubinskas. After his arrival in 1982 he redecorated and refurbished the church and the parish hall. 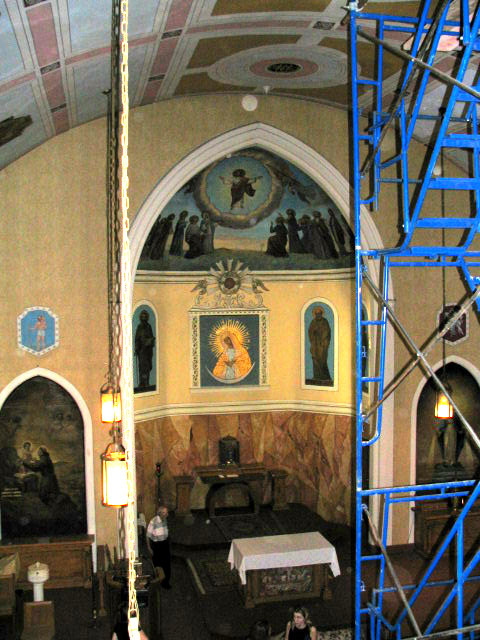 The centerpiece of the restoration – if of dubious aesthetic value – was the installation of a set of disproportionately large stained glass windows, in a 1950’s modern style, showing the saints and sacred places of Lithuania. Fr. Padubinskas rescued them from a closed Lithuanian parish in Brooklyn. Our Lady of Vilna was an object if minor lesson of how even a parish that had suffered the most adverse “demographic change” imaginable could be revitalized through energetic leadership. 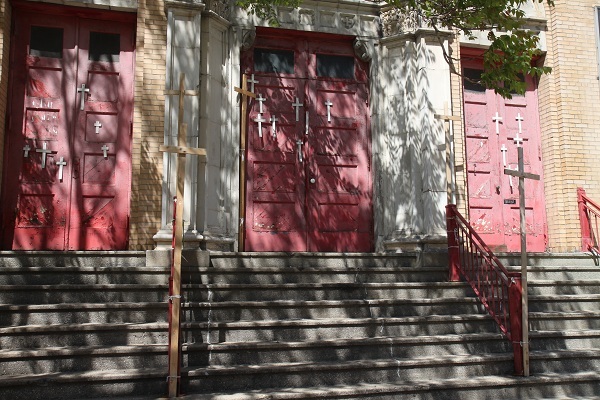 It was in the early 1980’s and in this out-of-the-way parish that the Latin Mass (albeit Novus Ordo) returned to New York under the leadership of Fr. Peter Stravinskas (who, by the way, seems to be back in town once again). 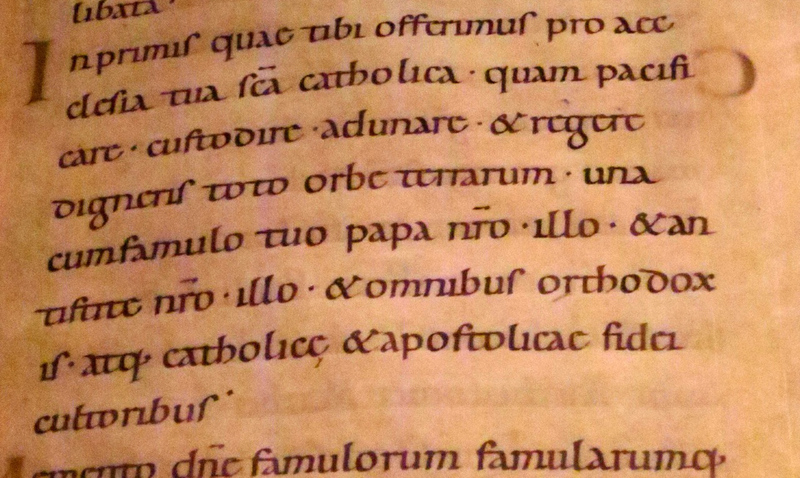 There were many odd things about these early Latin Masses – and about some of the congregation as well. 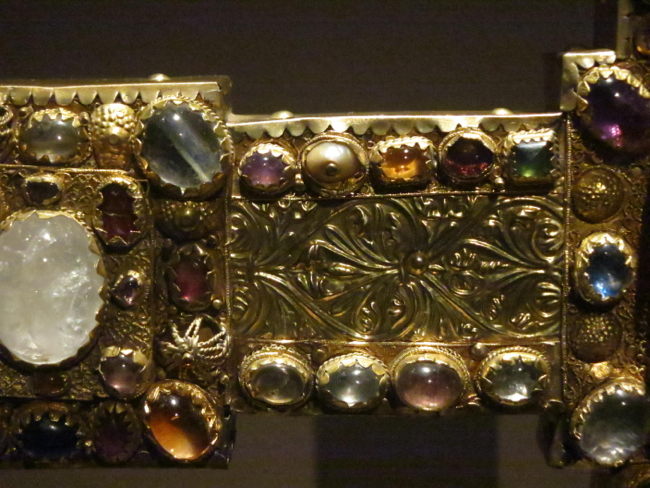 Liturgical eccentrics and cranks made their presence known just as in the comboxes of today’s websites. And it quickly emerged that the individual whims of each celebrant remained decisive for the Latin Novus Ordo, just as in the vernacular version. But despite all the criticisms that could be made, at Our Lady of Vilna the mass was at least said correctly, and in Latin. The glorious hymns and sequences resounded once more for the first time in many a year. Could any participant forget the Corpus Christi mass and procession – led by a retired bishop? The procession wound its way outdoors before an audience sweltering in hundreds of cars backed up before the Holland tunnel entrance. Quite a few of their occupants pulled out cameras and video equipment as if some strange, primitive ceremony were being reenacted. Just as in the case of the later “indult” regime for the TLM, when the clerical personnel changed the tentative return to tradition at Our Lady of Vilna disappeared. Father Padubinskas left in 1989 (he died in 2008). The parish seems to have fallen rapidly into decline after that – years later the main church had to be closed because of water damage. Finally, in 2007 Cardinal Egan ordered Our Lady of Vilna to be closed and razed in a manner particularly drastic even for him. 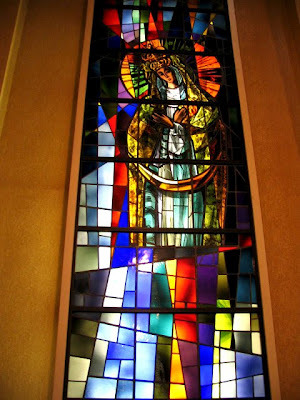 The announcement of the closing was casually made outside of the official “reconfiguration” plan in which Our Lady of Vilna had not been mentioned. The pastor paid the Cardinal a visit uptown to make the case for his church only to find that the Cardinal had had it padlocked upon his return. A long confrontation involving the parishioners, the Archdiocese and even the Lithuanian government seems to have reached an end late in 2011 when, on appeal, judicial approval was given to raze the church. So now the modest church of Our Lady of Vilna, with its pretty facade and miniature towers, stands closed and forlorn, awaiting its fate. A number of plain wooden crosses have been attached by the parishioners to the exterior of the church. They remind us of the famous hills of wooden crosses in the homeland that served as a silent sign of resistance to communism for so many years. It has been reported that Fr. 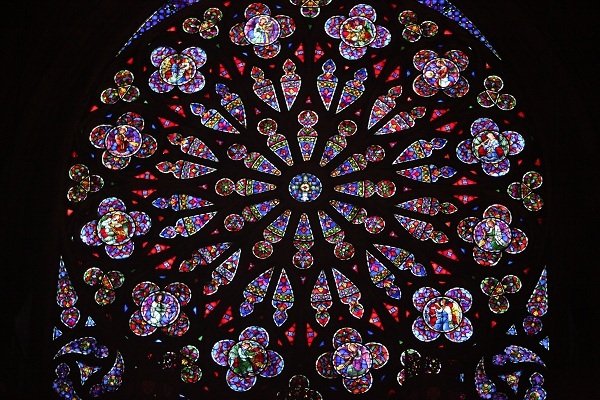 Padubinskas’ windows will be heading there too – as long as the Lithuanians can come up with the money to ship them…. See this WEBSITE on the history and recent developments of this parish. More details and picutures of the interior can be found HERE. Thank you for the history lesson – I was surprised to learn that there was a Latin Novus Ordo at Our Lady of Vilna. Do you know of any other regularly scheduled Novus Ordo Masses in Latin offered in New York between 1970 and the early 1980s, or was one this the first? As a related question, I’m curious which New York parishes first received the indult for the TLM under the terms of Quattuor Abhinc Annos and Ecclesia Dei Adflicta. I had the impression that St. Agnes on East 43rd Street received an adult fairly early, but I don’t know whether it was the first. 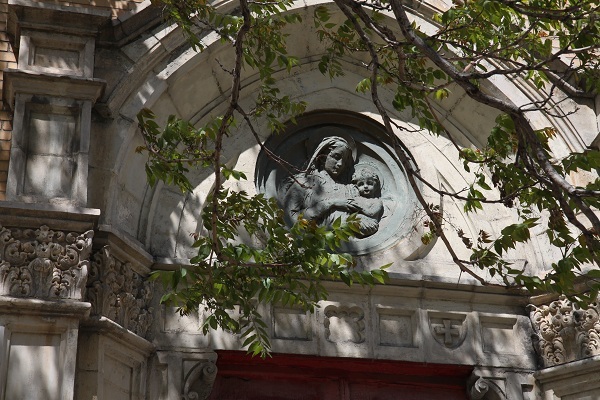 Maybe Our Lady of Mount Carmel in East Harlem? As far as I am aware, the first regularly scheduled Novus Ordo Latin Masses were at Our Lady of Vilna. Indeed, I see quite a few people who assisted at those masses at Manhattan TLMs today at Holy Innocents and elsewhere. Rgearding the first indult TLM – that was at St. Ann church – at the time the cathedral of the Catholic Armenians. It was deliberately scheduled by the Archdiocese at 2 in the afternoon on Saturday to discourage attendance. Moreover, for the very first mass a large crowd arrived only to find the Archdiocese had cancelled permission at the last minute. Despite these setbacks, the celebration of the Traditional mass was successfully introduced at St. Ann’s in the following weeks. And despite the subsequent availability of Sunday TLMs at the churches you mentioned, that Saturday afternoon TLM continued for years until the destruction of St. Ann’s. St Anne’s Armenian Rite Catholic Cathedral, on 12th St around the corner from the famous Strand bookstore, unfortunately razed a while back after being sold, had the Latin Mass (Tridentine) early on but only on Saturday afternoons. I remember going there perhaps as early as the early 1990s or maybe even late 1980’s. Back in the dark days before Summorum Pontificum.